In addition to sitting by the fire, keeping warm and reading, I’ve passed winter hours with a few crochet projects. 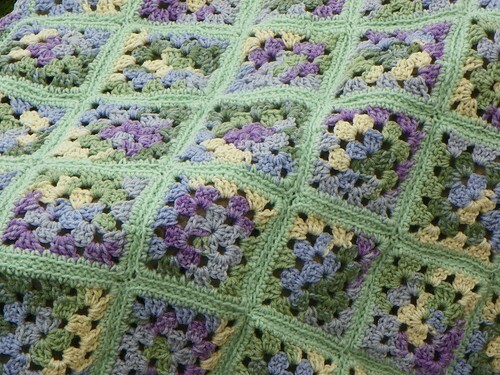 I started the granny square afghan, above, while riding on the train during out September trip to Vancouver. That’s Arthur, admiring the finished product. 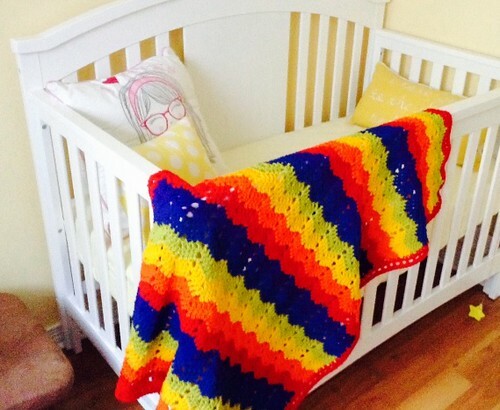 This rainbow afghan was a gift for the newest addition to our family, granddaughter Coralie. 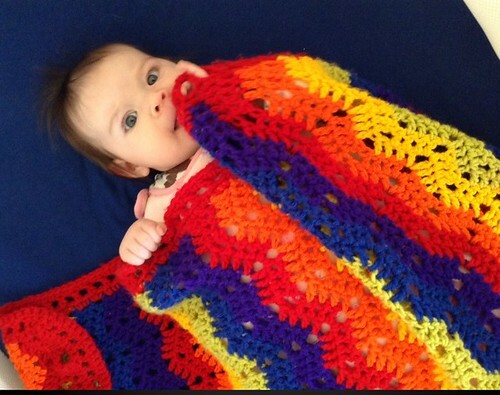 The primary-colour rainbow pattern is a favorite of her mom. Coralie seems to approve too. Here she is, giving it the baby taste-test. 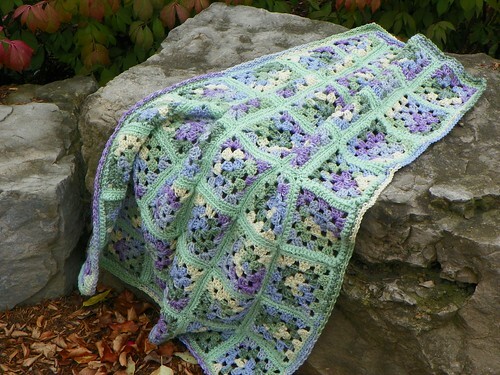 And finally, here’s another patchwork-style afghan, which I just finished this weekend. That’s Buddy relaxing and enjoying a little wash in the afternoon sun. 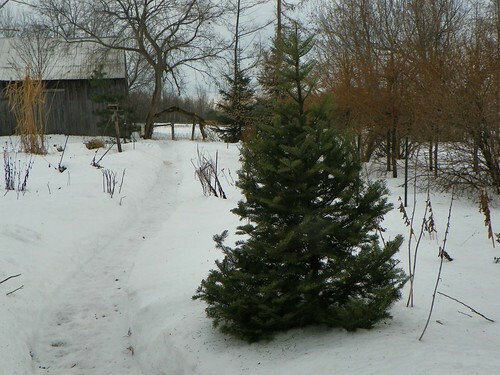 Our Christmas tree is standing near the birdfeeder now, providing a perching spot for birds and a bit of greenery outside the door. 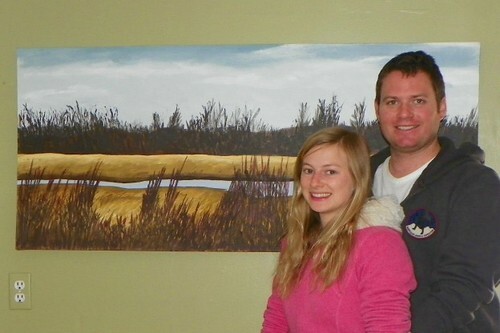 We enjoyed a pleasant holiday, with our three daughters all home for Christmas. Of course, sharing time with family is the best part of Christmas, but we also shared some wonderful handmade gifts this year. 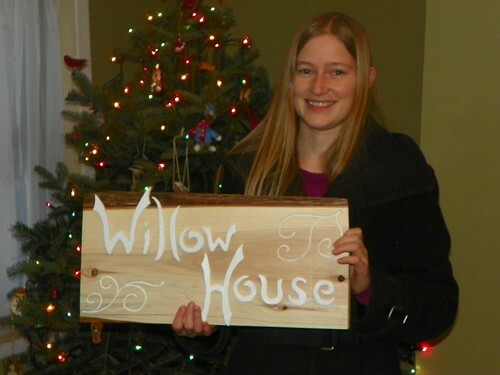 Here’s Fiddlegirl with the Willow House sign she made for my garden. Isn’t it perfect? She has become a proficient woodworker. 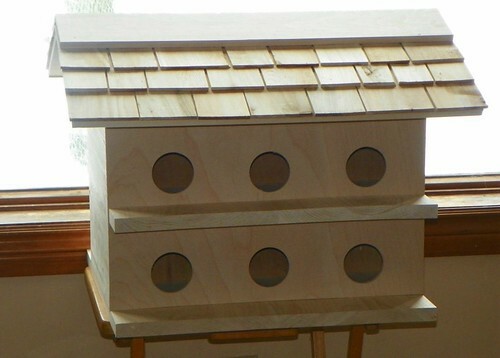 For my December birthday, I was thrilled to receive a Purple Martin House that she constructed. I’ve been wanting one since Seabrooke told me she could hear martins down by the pond a few years ago. I can’t imagine them turning down such elegant accommodations this spring. 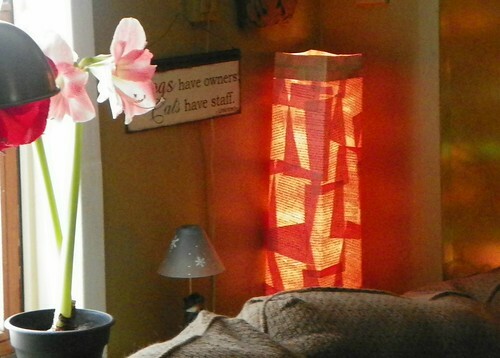 Seabrooke’s imagination and ingenuity shine through in this accent lamp she made. 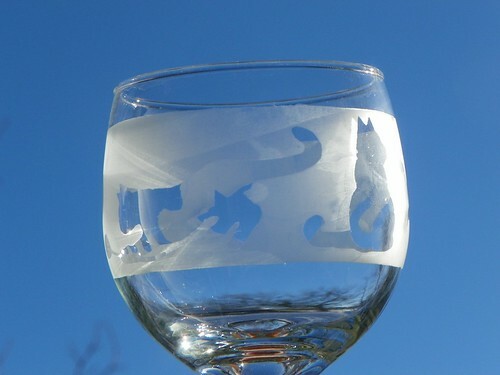 She also etched this charming kitten design on a wine glass for me. 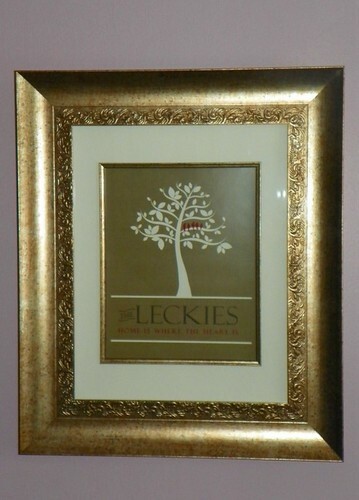 This family tree, which is now gracing our front hall, was designed and assembled by Ponygirl. Beautiful and unique! For my part, I completed a couple of crochet and knitting projects, and for Ponygirl and her beau, painted this landscape designed for over their sofa. 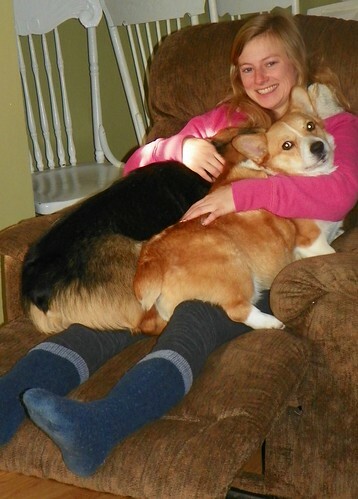 Finally, here are Macy and Remy with Ponygirl. At Christmas, like every other day of the year, their presence in our lives is a gift. 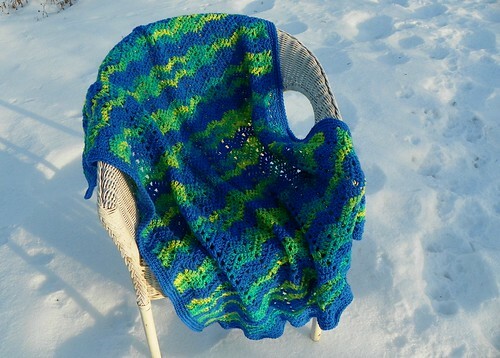 While I was working on this cheerful blue and yellow afghan, its colours reminded me of rivers running through green fields dotted with dandelions. Or maybe daffodils. No snappy title popped into my mind, so I solicited suggestions from the kids. Ponygirl offered Day at the Beach. Fiddlegirl came up with Shining Waters and Earth and Sky, while Seabrooke suggested Blueberry Sorbet. I liked all of these ideas, and went with Day at the Beach for no other reason than that it arrived in my inbox first. 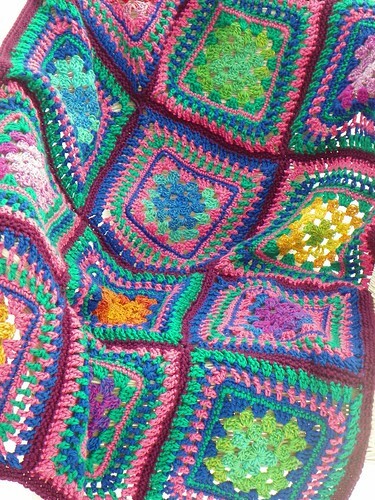 I feel my jag of ripple afghan crocheting may be drawing to a close. Maybe one more before spring. As you can see, I’ve been spending a lot of hours indoors by the fire this winter. 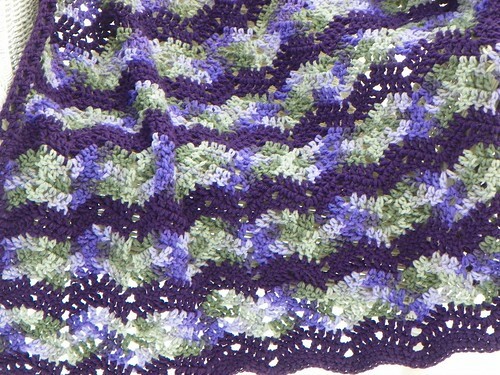 I’m into rippling wave afghans just at the moment. When chosing colours, I indulge whatever fancy takes hold of me as I stand before the yarn display at the craft store. 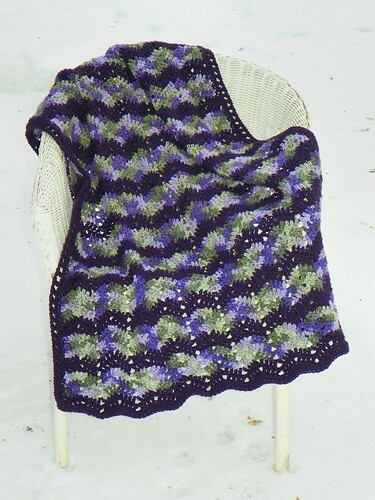 I think this little afghan is ‘plum perfect’! 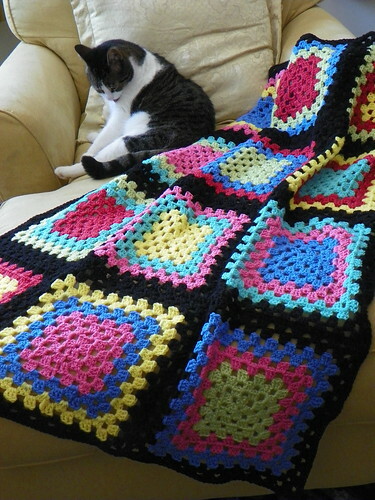 On a warmer note, here’s the little afghan I’ve been working on during quiet post-Christmas evenings of TV viewing. Thank goodness for the new January schedule! Yay for new episodes of Republic of Doyle! Hurray for Doc Martin and Downton Abbey, our favorite Brit imports at the moment. We’re not big TV watchers, but in the winter, working on some crocheting while keeping an eye on the TV is a pleasant way to pass the cold evenings. This simple classic ripple pattern doesn’t require much concentration, but makes a pleasing design. 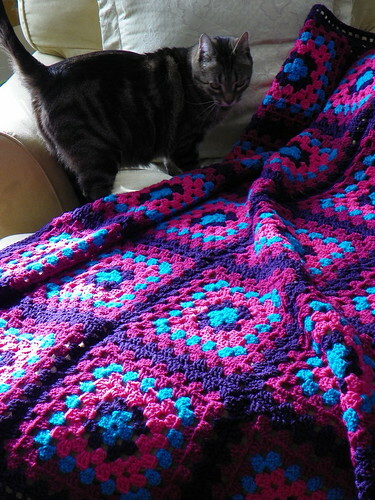 Afghans based on versions of granny squares are great for portability, but when the squares are done, I find the task of joining them a nuisance. That’s the advantage of a pattern worked all in one piece. No joining! One of the nice things about keeping a blog is that it gives you a substantial archive of memories you can look back on and enjoy. 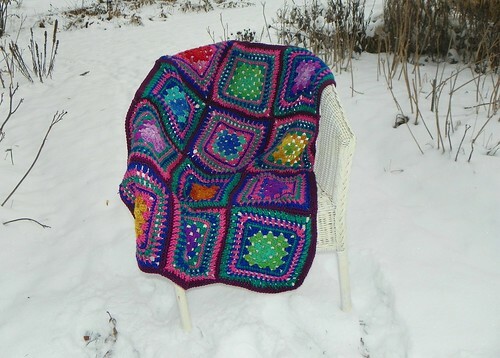 I therefore wanted to record my last handiwork project of 2011, this lap-sized afghan of many colours that I completed as a Christmas gift for my Dad. He lives in a long-term care facility and I thought these bright shades might help to brighten his days just a little. I didn’t get in any hiking this weekend. The weather was cold and rainy. Beyond that though, I was away from home, having travelled to the west of Toronto to stay with my 83-year-old aunt who underwent minor surgery last week. Even minor surgery is pretty major when you are 83, and I was glad to be able to help out and visit with her as she got back on her feet. My aunt is a long-time sports fan, and we passed some of the hours keeping tabs on the latest developments in the Major League Baseball playoffs. My aunt knows all the teams and players and filled me in on background details. We’re rooting for the Detroit Tigers and the Philadelphia Phillies. I don’t normally follow baseball much, but I don’t mind watching sports on T.V. because you don’t have to pay close attention and you can easily work on a project at the same time. 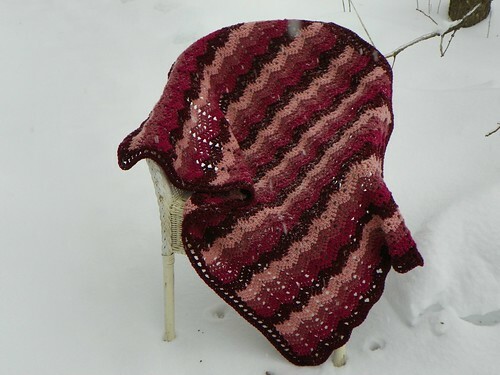 I was working on completing a small afghan that I started way back in the spring. I set it aside during the hot summer weather. 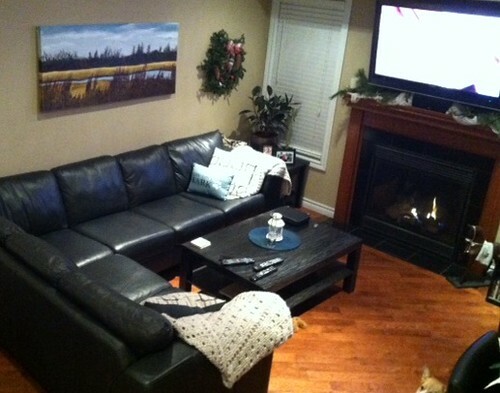 This cool, quiet weekend was the perfect opportunity to finish this project. Here’s how it turned out.